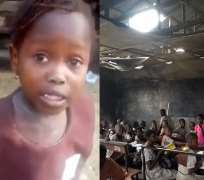 Delta state government has received hard knock over the deplorable nature of Okotie-Eboh primary school 1 in Sapele local government council, attended by Miss Success Adegor, who was chased out of school over alleged inability of her parents to pay her school fees. “I'm also convinced that no good road passed through that area. Commissioner, please when you fault the head teacher for sending Success home, fault your ministry for allowing human beings study under such a dehumanizing environment in Delta State and Sapele to be specific”. “The Commissioner's outburst on the Head teacher of Okotie Eboh Primary School I Sapele shows that he is not aware of his surroundings. He alleged that “Levies are collected in ALL public schools in Delta State. Before going to Sapele, check the schools here in Asaba and find out if the specified levies are being followed. And if you doubt me call for receipts given for payments and what they collect for sportswear. The case of Success Adegor might be a blessing to other Delta children in due course. Until you're back from Sapele, we keep our fingers crossed. But please make your findings public”. Said she: “Then this year WAEC only is #17000 and NECO is #14500. So why is d commissioner for Education in Delta state saying education is free? Pls my people Education in Delta state is pay as ur child goes to school. Everyday, there must be something to pay for. D teachers will not ever cover their scheme of work to enable dem force d students to stay behind for Compulsory lesson which dey charge dem #2000 every month. With a population of over 100 studentsooo .I pay this every month including Dec. which dey only went for just 2weeks. I am tired of their demands for one money or d other. So pls don't misinform d public dat education in public schools are free cos its not true. During d tenure of Governor Uduaghan, WAEC was free. So what are we talking about? Thank God for d people God will use to liberate this family needs”, she added.